As a child I patiently wait for new episodes of cartoons. A week seems like forever. 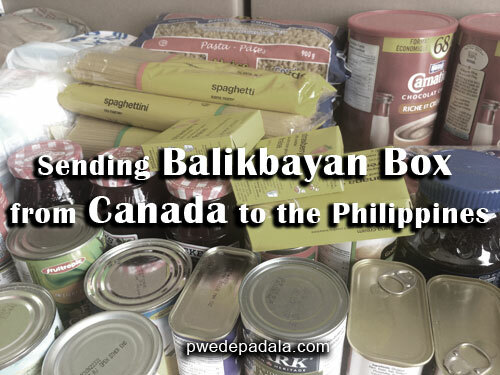 But when it comes to a balikbayan box shipping from Canada to the Philippines, I was excited with every passing day. The struggle in opening the box. The cold, pleasant smell of everything inside. It’s all worth the wait. But now, it is my turn to give back and let someone experience the same feeling I had as a child. Be forwarned though, all OFWs has to master one more thing other than packing a lot of things in the balikbayan box. Find an accredited freight forwarder with a good track record. I was fortunate to send all the balikbayan boxes to my family in the Philippines in spite of a few weeks of delay. I’m grateful to have recommendations from relatives about a reliable freight forwarder. If you don’t know who to ask or want to learn more, I gathered a list of freight forwarders that I’ve read in the newspaper and searched online. Note: the list is not an endorsement. I still encourage you to check any positive and negative reviews about the company before sending off your well-packed boxes to a long journey out in the sea. And if you know a reliable agent that is missing on the list, leave a comment. I’ll update the post for everyone’s convenience. UPDATE: The suspension of CAO 5-2016 and CMO 14-2017 will take effect until March 31, 2018. Reminder: Click here for more information about the update of suspension. The Bureau of Customs has a NEW RULE about duty and tax-free balikbayan boxes. Download the information sheet for consolidated shipments of balikbayan boxes. I arranged the list in alphabetical order and not based on significance. Choose wisely. Compare the price and avail the discount if any. Tip: Send small balikabayan box to save more money and time. Quality is better than quantity. 1. Atin Ito Freight Forwarder Inc.
Other Service: Remittance, The Filipino Channel (TFC), travel, and grocery. It offers weekly shipping from Calgary to the Philippines. You can track the shipment online and choose from different balikbayan boxes: regular, bagahe, and bulilit. 4. Forex Alliance Cargo Inc.
Forex Toronto was established in April 1998. It provides courier service to the Filipino community in Toronto. On May 19, 2016, the Consumer Choice Award for Business Excellence (two consecutive years) was awarded to Forex Toronto. The introductory price was charged for regular parcel boxes which were replaced for free when my boxes were picked up. The company send the boxes through direct shipping from Calgary to Manila. Within five weeks, my family received the boxes. While other balikbayan box shipping companies show the box prices based on the destination, on LBC Express website you can calculate the cost by entering the size of the box and details of the package. Try this feature and confirm the cost to get the best deal. Through the live chat, you can schedule a pick up date. Manila Express was suggested by a reader so here’s a bit of information. 10. Reliable Cargo Express Corp. 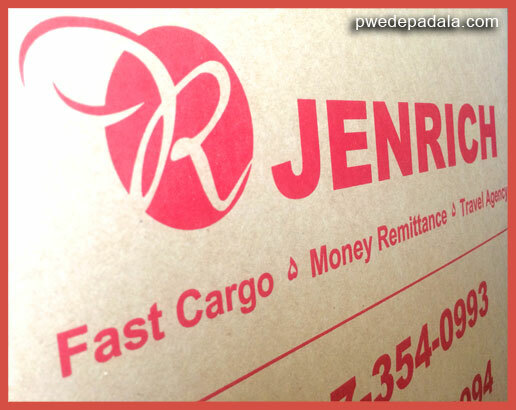 When I was writing about how to send money online to the Philippines, I discovered Reliable Peso Remit Inc. Later I found out that it is part of a company that also has a balikbayan cargo box service known as Reliable Cargo Express Corporation. The shipping service comes with $300 insurance and box replacement. If you are worried that the boxes will get stuck in the warehouse, you’ll be glad to know that, Reliable Cargo Express offers weekly shipment. Star Cargo Express offers weekly shipping. If you send two regular boxes then you’ll only pay $10.00 for a bulilit box. ABS-CBN StarKargo started in U.S. and in 2016 it provides door-to-door shipments from Ontario, Canada to the Philippines. An Ontario resident and TFC (The Filipino Channel) subscriber can avail the %5 off in StarKargo. You can also track the package online. Among the freight forwarders, StarKargo has an organized, informative website which add to its credibility. But that’s not the only criteria of an accredited freight forwarders that you should look out for. 15. Sunfreight Cargo International Edmonton Ltd. Cargo Rate: Call for the current rates. No pick up charge within Edmonton area. Other Service: Remittance and Filipino products and specialty foods. Established in 1988, UMAC was known back then as Forex Cargo. It was the pioneer in the freight forwarding industry. Wondering what is the origin of company’s name? It was named after Teodoro “Uncle Mac” M. Carino Jr., the late Chairman of the Forex Family of Companies. As of February 28, 2019, these are the list of accredited sea freight forwarders from Department of Trade and Industry (DTI). Atin Ito Freight Forwarders Inc.
Sunfreight Cargo International Edmonton Ltd.
I’m guessing there are more freight forwarders in Canada because some of the companies in the list doesn’t have a website and rely on print advertisement. So before I end this post, I encourage you again to contribute in the list. Lastly, your feedback either good or bad can help the OFWs to send balikbayan box from Canada to the Philippines through a reliable freight forwarders. How was your experience in sending balikbayan boxes? NEXT: Do You Belong to the Rambo Generation? Affirmative! I sometimes order through Amazon and have them shipped sa Pinas using POBox.ph. I do this for items na ala dito at items na obviously cheaper sa States (I dunno why mas madalas mura mabibili sa Amazon to think na made in China at mas malapit ang Pinas kesa US such that it should be cheaper dito in terms of added costs owing to transportation). My experience w/ POBox is mixed because of the actual freight forwarder used in shipping my box from California to Manila. If Forex Cargo tracking number is what I receive, I can readily almost get instant online update sa website nila (mabilis and seems automated ang tracking info where minutes ang lag between box movement and tracking info update). However, if Umac Cargo ang na-received kong tracking number, nakupo, kabaligtaran ng Forex. Online tracking info update seems dependent on when its staff can update the website. So in case na out for delivery na pala yung box at aalis ka pala ng bahay, di mo malalaman. Unlike Forex, at 7:00 or 8.00 AM., you can see sa tracking website nila na out for delivery and you just have to wait for it. Parang sister companies ang Forex at Umac but their services are day and night apart. Thanks to your tip. I might consider POBOX instead of sending balikbayan boxes which is costly and time consuming. I like to shop online and Amazon.com has more choices than Amazon.ca although I might need to pay more depending on the foreign exchange. I look forward to all the forwarding companies to have online tracking to put their clients mind at ease. To be honest, I have a friend from Canada and he will be coming back in the Philippines by next year alone. However, he doesn’t really know how to send his packages to us since it’s his first time ever sending a packages. I guess, this post is a big help for him. I’ll try to refer this to him. Thanks and I appreciate your time. Hi, which is the most reliable company you can recommend to send balikbayan box from Calgary to Philippines North Luzon? I can only give feedback about Jenrich and Forex. I haven’t tried other forwarding companies other than these two. So far all my boxes arrived in Manila but it takes longer than 2 months for Jenrich to deliver my boxes. Can you share with us Jen what company you go for? Hi! Is it safe to send money online at Reliable Peso Remit Inc.? I just have read your review above but no further information about online remit. Can you share your experience about. Thank you. I haven’t tried Reliable Peso Remit Inc. For remittance, I recently tried Remitly (wait for the review) but PayPal has been tried and tested way to securely send money in the Philippines. I am using World Remit.. . so far it’s great and they can pick it up in M Lhuillier. Please is there a very reliable freight forwarder from Nova Scotia to Surigao del Sur? Thanks for your answer. I called Manila Express. They dont send balikbayan box anymore Just remittance only they have. It looks like Manila Express are out of business. Hi Evelyn. Have you tried calling the Manila Express? Any feedback for Reliable Cargo Express Corp. when sending BB box to PH? How many weeks to receive the box in Manila? Hi, which one of these cargo’s practically is the best sending a box from Toronto to Leyte, most importantly including one tablet for my in-laws. Thanks. I wonder if AMJ Campbell still sends boxes to Manila, as I haven’t seen them on the ads anymore. Are they still providing services? Never heard of AMJ Campbell but let’s see if other readers will have an idea about it. How many days does the package arrive from Canada to Butuan City Philippines? That’s hard to tell. But in my case, I the boxes arrived in Manila between 1.5 – 2 months. It depends if the boxes get stuck in the customs or other reasons. Call the forwarding company for more reliable feedback. Hi Chit, do you have the contact number for luzvimin in mississauga? I always send my boxes through LUZVIMIN here in Mississauga to manila. They charge $75.00, about 6 to 8 weeks my family received the package. Xp express their Philippine counter part based in cavite. Contact Ray or Nope Santiago for pick-up. Their shipment is every 10 days. Know anybody who can pick up cargo from Victoria and send to Bohol? Thanks Sol. You can try Manila Express. Press CTRL+F and type the keyword (eg. Victoria) to navigate the site. Refer to the blog post for updates. I sent a box on August 30, 2016; until now it didn’t arrive. I had 2 months vacation in the Philippines; I came back and the box is still not delivered. Hi Julita. It’s quite unusual to hear your story. Have you tried contacting the cargo shipping company. Are they returning your call/email etc? This is not a good sign to do business with such company. Hope you can give us an update. I asked my friend to follow up last November 2016 and they said that it’s already in Manila warehouse ready to be delivered. When i came back I missed placed the receipt and didn’t call again. Only when my sister reminds me that she haven’t received yet my box, so I tried to find the receipt again. She said she will call them one of these days so I sent her the information. Last night I was trying to used the tracking number to locate it. It said this tracking number is unavailable. I guess someone should come to their office in Manila since it’s been so long. I have sent LBC box from Toronto to Cagayan de Oro in 2014 and it arrived December 1st week earlier than expected. It cost $80 (Canadian dollar), at that time…in terms of the route, I wonder if the box will go to California before it will be sent to Manila Philippines because in the United States depending on which state you are, the boxes are enrouted to one place to another depending which port is closer to your state . After which, a certain period of time you then can track the box online using LBC tracker. You cannot track the box right away online by the time they pick up on day 1. Thanks for the info Jonah. Additional info could also help like Facebook page or website. Here in Fort Mcmurray,are there people dealing with balikbayan boxes.Asian mini-mart was not but it was them w/c was in the manila express list. Hi Frances, I think that’s a great topic for a blog post so stay up-to-date. Hi, Frances. Here’s a new post that answers your question: Send Package from Philippines to Canada. How about New Brunswick. Can you recommend any? I’ll update the blog post once I found a courier service in New Brunswick. Thanks for asking. Try Manila Express I don’t see them listed here but I personally have no complaints. I have full confidence in their ability from when my boxes are taken to the main office to when they are delivered to Leyte and Mindanao. I have found Mindanao takes about one week additional time . I’ll look for more info about Manila Express Jim, and add it on the list. Thanks! Boxes going south include Leyte and Mindanao are delayed. Boxes sent in September have not arrived. I have talked with three other people that are experiencing the same situation. Last word I had was boxes would arrive December 31 but nothing has arrived. Of the three people I know that also sent boxes in September one filipina has one out of three boxes. Definitely something is wrong. The main problem is that we can’t track the boxes on line. Forex Cargo Alliance Edmonton tracking box is a dud. Leads nowhere and only tells you that you have sent something. You must phone them. But again, their voice mail box is always full and can’t leave messages. When you reach someone, it is 50/50 if they are too busy to check. USA has a tracking APP but Canadian numbers don’t work in it. Options are: keep calling until you get lucky, Call in Manila directly or hope for the best your box will be there on time regardless of our worries and concern.